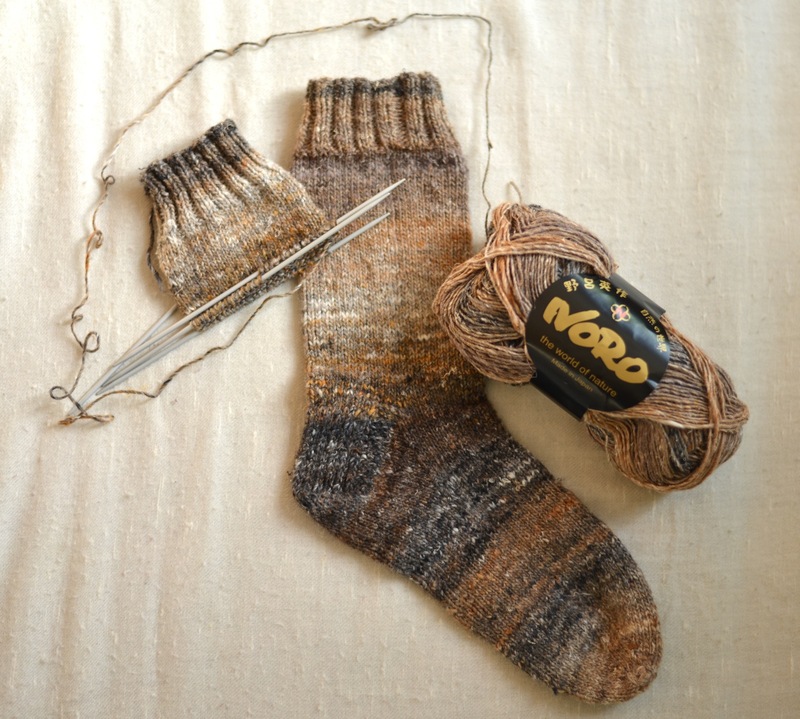 Last week I bought some beautiful Noro sock yarn from the Knitting and Stitching show. 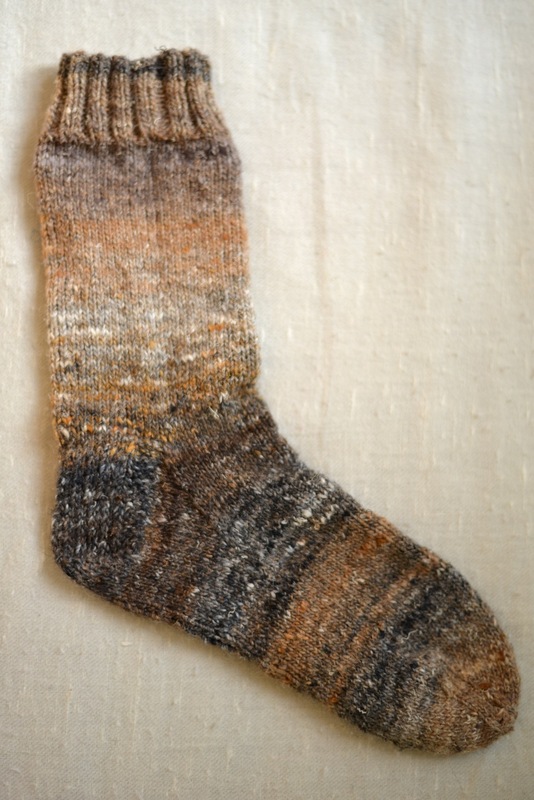 Here’s the result of my first attempt at sock-knitting. 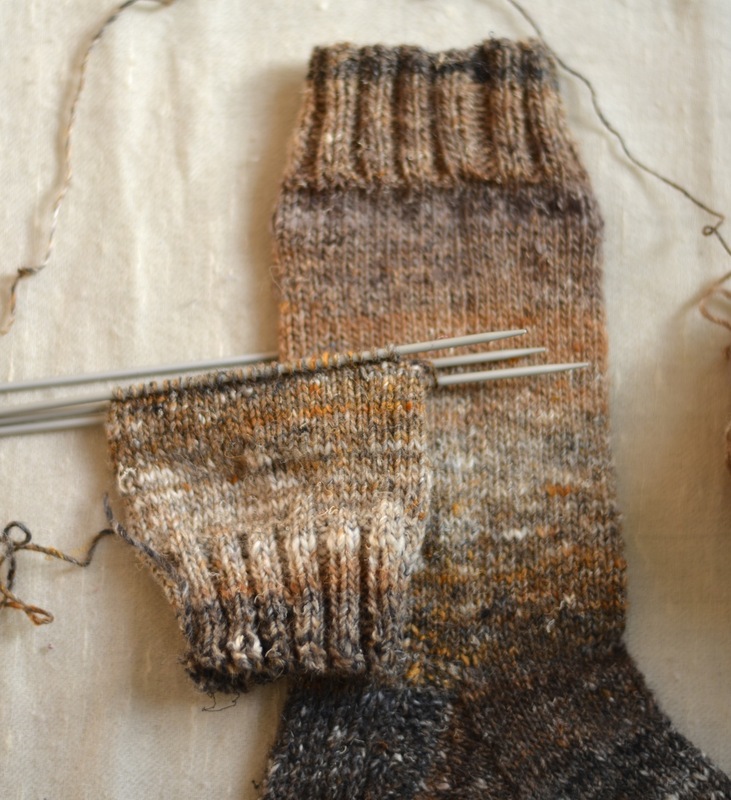 It’s a much more enjoyable and interesting process than I’d previously thought, and made especially easy by Charlene Schurch and her book ‘Sensational Knitted Socks’. She’s basically done all the possible calculations you might need to knit a sock regarding guage, fit and pattern variations, and then put them in handy charts. While I was teaching new knitters to cast on at Ally Pally, I got a lesson myself from a very kind Danish lady on how to knit continental style. Instead of holding the yarn in the right hand, as I was first taught, she, along with much of Europe, knits with the yarn in the left. Once you’ve got the hang of it, this is supposed to be the most efficient and fastest method, although I think I need to finish the other sock before my brain gets round the switch. One side effect of the Noro yarn coming in beautifully graduated colours is the difficulty in making two socks roughly the same. Here’s my second attempt at starting sock no. 2 – which came with the realisation that ball no. 2 was wound in the opposite direction to ball no. 1. But I figure that the colour scheme isn’t crazy enough to warrant worrying about matching them up. They’ll be odd, but in an endearing, eccentric way, not in a ‘where’s the other sock?’ way. Let’s hope my Dad* thinks so anyway when he unwraps them. This week (and next) I’m in Ukraine teaching art. Amongst drawing, painting, photography, art history, printing, T-shirt design and a multitude of games, one of my favourite activities so far has been making animations with my pupils. We used stapled booklets of tracing paper, and, starting from the back, drew a picture on each sheet, changing it a little each time. Try this once and you’ll realise how much work went into the old Disney films (24 frames a second to be exact). Here’s the demonstration piece I made before I arrived. There are 16 different frames in total (numbered in the corner), edited in iPhoto and iMovie. The swiggle sweater is finally finished – sleeves, collar, seams and all! Better pictures and a pattern to follow. Here’s my (slightly) modified version of Aunty Penny’s pattern for a mitred square. These measurements are specifically to make a 10x10cm square in Debbie Bliss ‘Angel’ mohair yarn. Debbie Bliss kindly donated this and lots of other beautiful yarn to The Mill, so we’ve been putting it to good use for our group piece for the forthcoming Softer textiles exhibition. Cast on 31 sts on size 5mm needles. Row 1 and every following alternate row: Knit. Row 2: k14, sl1, k2tog, psso, k14. Row 4: k13, sl1, k2tog, psso, k13. Row 6 and all following alternate rows: Continue reducing in the same way, with decreased stitches forming central diagonal line, until 3 stitches remain. Following row: sl1, k2tog, psso. Cut yarn and pass end through loop. “I just discovered an interesting way of knitting squares, where you decrease a stitch in the middle of each row, forming a diagonal, as follows. “Re my comment of 20th April on diagonal squares, I’ve just been trying different decreases, knit 2 together or knit 2 together through back of loops, and for garter stitch it doesn’t seem to matter which one you do as long as it’s always the middle stitch and the stitch before that you knit together and you are consistent. 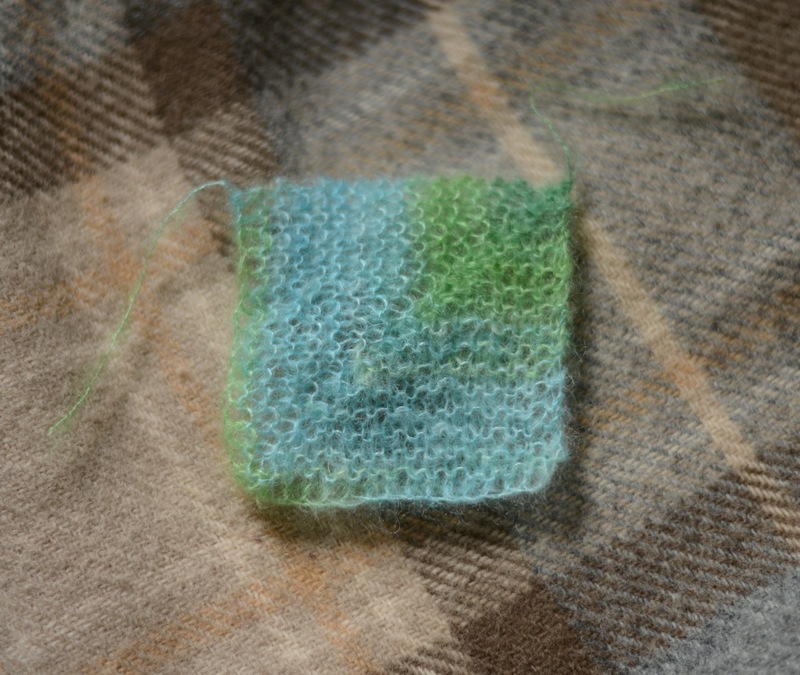 These squares are particularly fetching in rainbow yarn. In my desperate attempt to find good things about having to undo a portion of the swiggle sweater, here is some beauty found in the two wiggly strands of yarn code that appeared as I pulled (and pulled). Does this make me an exonuclease..? My first experiment with spinning and knitting newspaper is finished. Ta da! A sturdy pencil case (just so long as it doesn’t get wet). I’m off to gather materials for a knitting commission. Stitches and finishing techniques were running through my head before I opened my eyes this morning.. excitement has officially kicked in. I’m sworn to secrecy for now and can’t reveal any details just yet.. so here’s a nice picture of a cat named Billy in the meantime. The swiggle sweater front and back are now settling into their new, better behaved shapes, thanks to my first attempt at blocking! Blocking is great (why haven’t I done it before?!) because it allows you to have a bit of control of the size and shape of a piece of knitting after you’re done with the needles. It seems to help even out the tension a bit too. I soaked the pieces in water, then rolled them up in a towel to spin on a low setting for a few minutes. Then I laid them out on dry towels and a cotton sheet and pinned them down, using a tape measure to make sure the sides were straight. I ended up spraying them with a bit more water because the spin dry worked a bit too well, so took the opportunity to add a bit of rose water to the bottle for a sweeter, less damp wool smell. 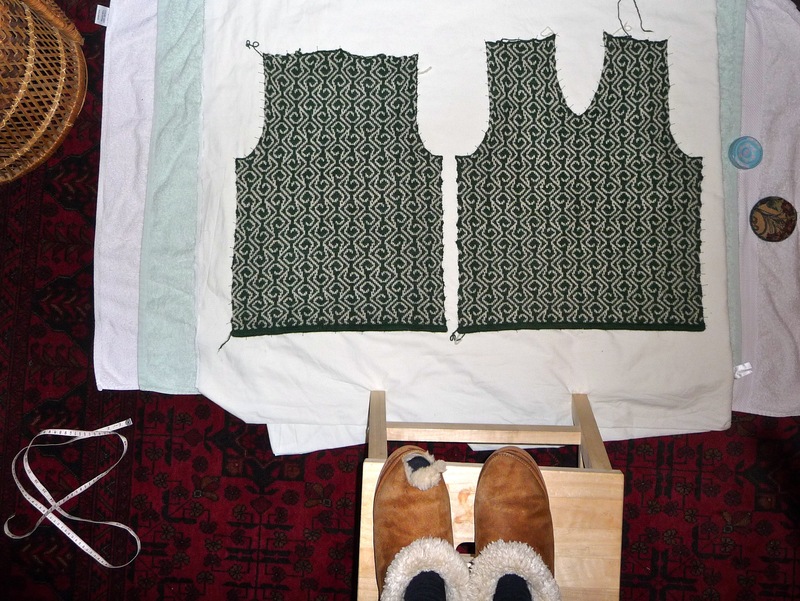 The end of this sweater is starting to come into view.. nearly there! By the way, do you like my peep-toe slipper? ..you realise that you’ve made the sleeve too narrow and have to unravel ten inches of otherwise perfectly fine work. Grr.